I will also provide a compatibility CD that will allow the game to run under ALL VERSIONS of Windows 10, 8, 7, Vista and XP, both 32 and 64 bit. Note: Sierra stopped hosting mutiplayer capability for this game years ago. Shall I dump the boiling oil, Sire? 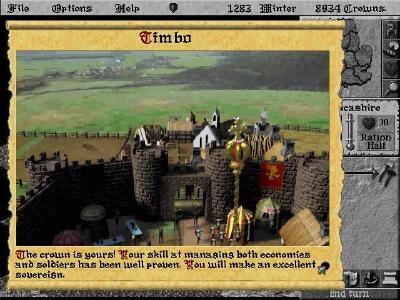 Realm II is a follow up the popular medieval strategy game Lords of the Realm. 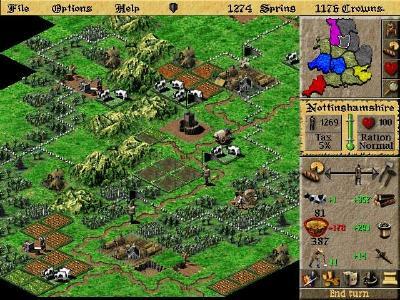 The first game was all about resource management i.e. taxes, population growth, land uses, industry etc. The idea was to take over the land and become king though superior ruling. Lords II pushes the original concept by adding real-time battles to the turn based game. In this version you can actually command your troops down to the individual soldiers. You start out with a humble territory set in thirteenth century England. You are one of five nobles who have divided the country. It's up to you to manage your crops, build weapons, construct a castle and raise an army to attack your neighbors before they attack you. There are five castle designs that you can build - Wooden Palisades, Motte and Baileys, Norman Keeps, Stone Castles and Royal Castles. Better designs cost more, require more materials and take longer to build but once built they increase the tax revenue and can hold more troops. When completed the castles get a minimum number of troops to guard it and you can garrison it with more troops as you see fit. 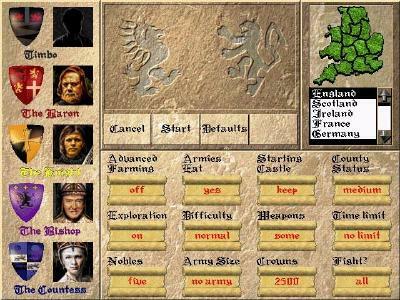 When you decide to build an army, the army interface allows you to select the size of the army and the types of troops which depends on what weapons you have built or bought from the merchants. The size of the army will effect the happiness level of the town because you are drafting these men away from fields and industries. Sometimes you can hire traveling mercenaries if you save up enough coins. This is an important reason to keep an extra 2,000 coins or so in the treasury. Before any battle you have the choice to control it or let the computer decide. This is a nice feature because if the battle if hopelessly one sided and you might not want to bother fighting it out. Sometimes in a long game you might get tired of the battles and just want to get it over with. The only problem here is that "autocalc" doesn't not take into account your superior battle strategy skills. You may want to fight even the hopeless battles if you have ranged soldiers who can be carefully positioned behind rocks or other soldiers. In any case, you can hit the autocalc button at anytime during a battle. 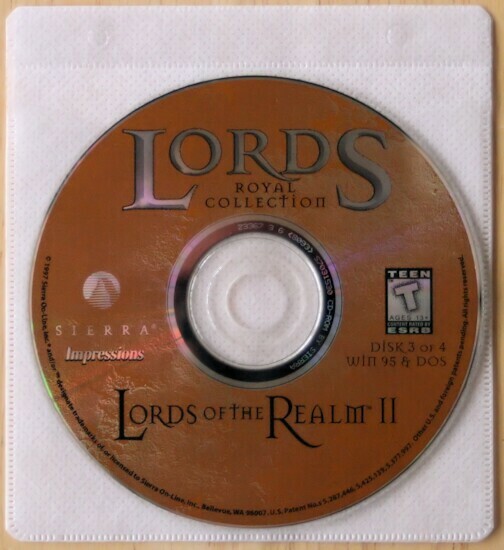 Like any complex strategy game, Lords II takes a while to grasp. One nice feature is that when you first start a game, a voice-over gives instructions on how to start off. In general, the voice-overs are excellent. Overall, I found the game enjoyable with its combination of turn-based strategy and real-time action sequences. The video cut scenes are first rate and add a flavor to the action. I did however find the resource maps and graphics to be confusing. When looking at the resource map you can't tell right away which industries are on or off. You can get this info from the map legend but think the map could have been a bit clearer. Some of the agriculture resource management is also a bit confusing. Something about feeding the entire village with milk and cheese bothers me. I would have expected seed planting to be the mainstay of the agriculture not cows. The battles are not as complex as say in a Warcraft game, but they serve their purpose and are only part of the fun of Lords II. These battles seem appropriate to the era and the sieges lend variety to the game.